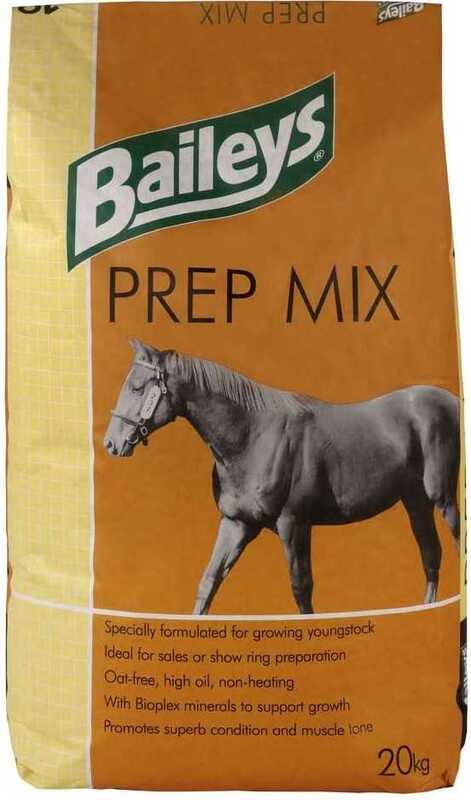 Prep Mix has been specifically developed for growing foals and youngstock which are being prepared for the sales or show ring. It offers a highly palatable all-in-one solution to promoting superb condition, muscle tone and top line whilst providing all the essential nutrients to support growth. The mix is oat-free with a super fibres and oil for slow release energy with the balance of Omega 3 and 6 fatty acids helping to bring a head-turning shine to the coat. The mix is nutrient dense so a smaller volume delivers the required energy and supporting nutrients without the risk of overloading the digestive system. Small frequent, digestible meals are key to reducing excessive glycaemic response and avoiding starch overload. Quantities are based on the “anticipated mature bodyweight” of the youngster or actual bodyweight of the adult horse.The actual/estimated bodyweights of a youngster’s dam and/or sire are a good basis from which to estimate the “anticipated mature bodyweight” ie. the bodyweight you believe the youngster will attain as an adult.